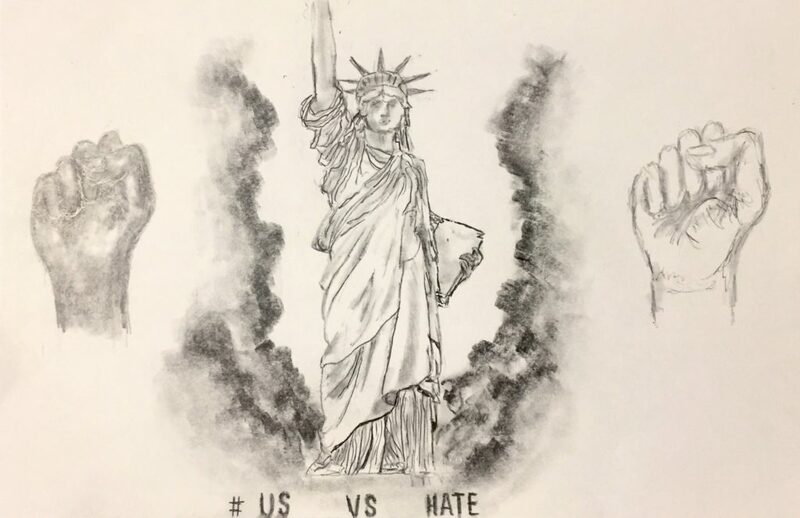 This stirring image of an inclusive quest for liberty and justice for all (a winner of our February Youth Vote) was created by a 11th grader at The Preuss School at UC San Diego. As teacher Ms. Bandy describes, she did a lesson using the New York Times Learning Network’s “25 Mini-Films for Exploring Race, Bias, and Identity with Students,” which involved video segments, individual reflections, and whole-class discussion. 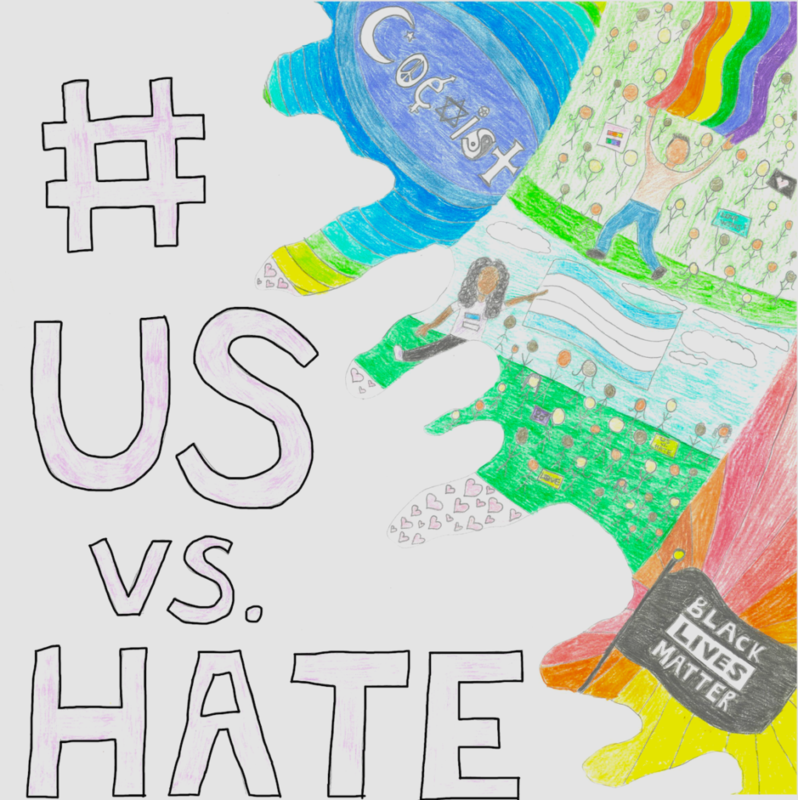 (This lesson can be found here: http://usvshate.org/more-specific-anti-hate-lessons/) She utilized the “Tools for Productive Group Dialogues” in preparation to facilitate conversations about topics like colorism and other markers of privilege. She feels students crave these discussions and are ready to have them, because they are processing everything going on in the world. This message will become a poster sent back to participating classrooms! “V. 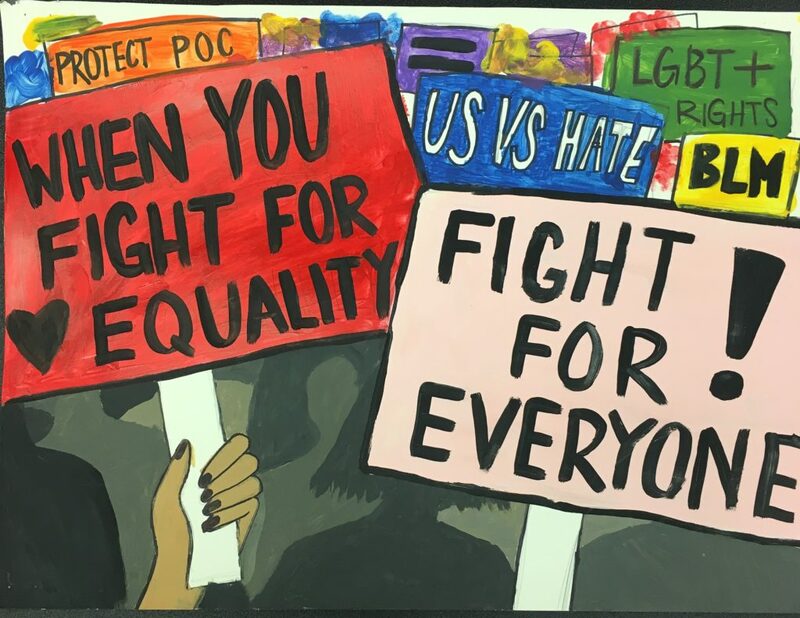 is a 10th grader who created her winning poster ‘When you fight for equality, fight for everyone!’ because she was inspired by the lessons that we studied. She thought a clean, simple message with bright colors might be the most effective at convincing others to support the causes about which she cares. V. hopes that her poster serves as a reminder to students across the county that they should use their voice in a positive way to support people who suffer injustices daily in America.” The poster is being sent back to participating classrooms! G., another 10th grader in Ms. Espinoza’s 10th grade English classes at Bonita Vista High created her poster with a similar message in mind. As Ms. Espinoza puts it, “She focused on wanting to make a positive message. The sources that we looked at felt so bleak, she described, that she wanted to find a way to be encouraging of her peers to consider differences a good thing rather than something that separates us.” G. described her piece, a Youth Choice this winter, as “peoples’ appreciation of differences dripping down a canvas to cover up the hatred.” This poster is also on its way to participating classrooms! 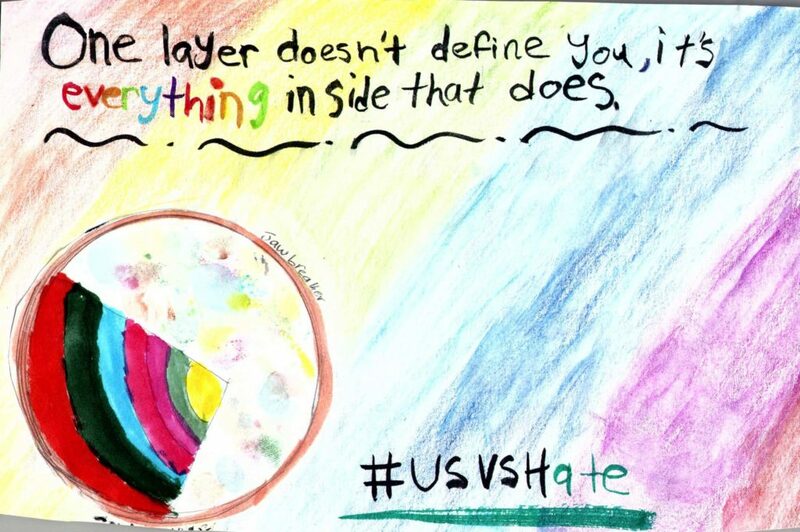 Xenia, a 7th grader at the Preuss School at UC San Diego, made this thought-provoking #USvsHate image about the many layers of our identities after her teacher, Ms. Van De Vanter, tried the lessons on Racism is Real (AFT/Share My Lesson) and Experiences with Race and Racism (Anti-Defamation League). (These lessons can be found here: http://usvshate.org/more-specific-anti-hate-lessons/). As Ms. Van De Vanter describes, “The class voted to make different versions of the same theme to reflect what they learned—that is, how our multiple identities interact to create complex human beings–and to teach others to look beyond the surface of our outer appearances.” Xenia’s won the Staff vote. “Everyone around you is equal and valid!” An eighth grader at Hilltop Middle School in the Sweetwater Union High School District made this call to recognize our common humanity after teacher Carmela Golden-Reyna invited students to join the EPIC Club, which stands for Equality, Peace, Inclusion, and Community. “In the club,” Golden-Reyna says, “students discuss their concerns about feeling discriminated against because of their gender identity, ability, race, or sexual orientation. 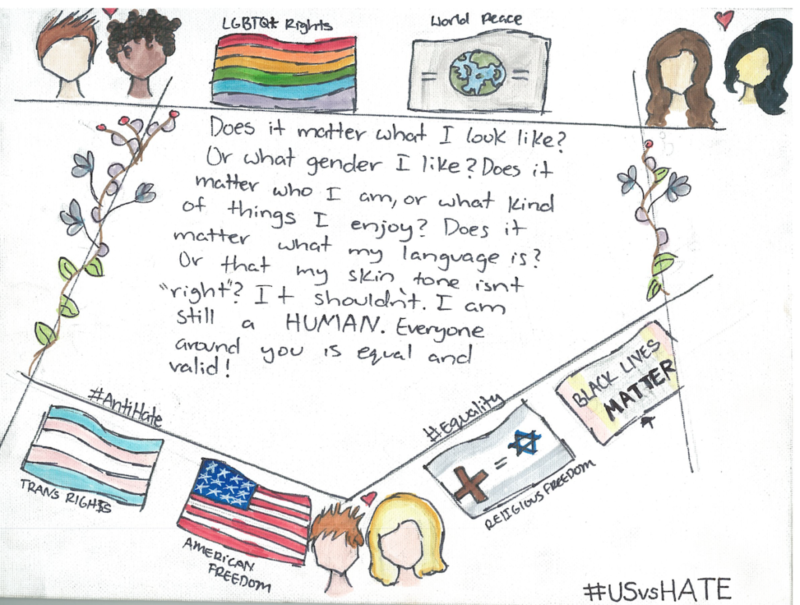 When it came time to work on #USvsHatemessaging, this student invoked her own experiences with feeling like an outsider and wrote a poem to remind young people like her that our differences make us special and that we should appreciate and embrace them.” This poem was a winner of the winter Youth Vote and will be reproduced for participating classrooms. We had never seen an anti-hate message made out of Legos before! But Ms.@SraPerucho’s first grade class at Valley Elementary in the Poway Unified School District figured out how to reach other children with this powerful #USvsHate call for including all in a school community. Teacher Perucho-Green describes how “We read the book One, by Kathryn Otoshi, to start our conversation into becoming upstanders stemming from a place of love.” (They used the Lesson based on the book One by Kathryn Otoshi , from Teaching For Change/Black Minds Matter at School). “Be different — be happy — be what you want to be!” Sixth graders at The Preuss School at UC San Diego created bookmarks for their #USvsHate messages, because they felt this would make anti-hate messages visible to every student every day. Student Sylvia Rodriguez made this anti-hate message in bookmark form, after teacher Mr. Kim did a lesson on the “Bullying and Bystander Effect.” (Such lessons can be found here: http://usvshate.org/foundational-anti-hate-lessons/) Mr. Kim felt this lesson was a good starting point to branch out into other topics on specific hate forms, and plans to works towards lessons on homophobia and other LGBTQ issues later in the school year. Sylvia’s bookmark was a winner of the winter Youth Vote. Mr. Kim views public anti-hate messaging as lights of positivity on campus, particularly for students who might not normally speak out about their experiences with bullying. We’re producing this bookmark for participating classrooms!